Cadel Evans calls Lance Armstrong fat. Evans disses Armstrong. Can it really be true? “He’s going to be bigger and more dangerous than in 2009,” Evans told Australian news agency AAP. What? Did he just insult seven-time Tour de France winner, cancer survivor, million dollar fund raiser and relentlessly famous endurance athlete Lance Armstrong? Bigger and more dangerous? 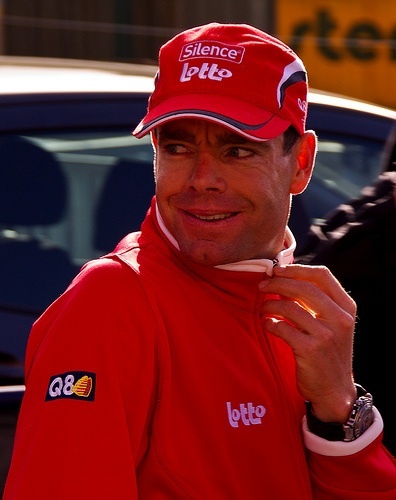 Is Cadel Evans out of his mind? Has he lost all reason, judgement, is he on some strange Australian walkabout, speaking in tongues, rambling with incoherent nonsense? In other words, did he just call Armstrong fatter and more violent? The mind reels. Is there any other conceivable interpretation of these remarks? Bigger, as in what, fatso, slob, Lone Star drinking yahoo living on Tex-Mex chicken burritos? Is that the bigger he is insinuating? Is Evans saying Armstrong has no self control, has lost the will power to manage his weight, that closing in on 38, the champion is a bloated, doughy caricature of his former hard-body self? And dangerous? Whoa, now there’s a loaded word? What are we talking about here, Cadel? Switchblades, guns, a chainsaw, a samurai sword? Just what exactly are you intimating? That Lance, a beacon of hope to cancer survivors around the globe, has undergone a violent personality change? What lines are we to read between here– is he Scarface, Rambo, a vigilante on a Trek? It just makes no sense. Why would a mild mannered, thoughtful and classy rider like Cadel Evans call Armstrong fat and violent? Is this just another misquote, goaded by journalists and taken out of context? Did they catch Cadel after a few mojitos too many or has the new world champion just lost his mind? Twisted Spoke wishes we had an answer. « Half-pedal to the new paradigm. Everyone on the electric bikes now! Have to say, this is the absolutely the funniest blog out there! I read it EVERY day, but never post. Just wanted to tell you that I appreciate the humor. This post was fall-down hilarious today . . .
Greg, what can I say, you’re a man of taste and substance. Hope you’ll keep reading. I have big plans for the blog moving forward, especially this summer then we get into the big tours. Got a new character or two to unveil with video and pod-casts. I’m already laughing just thinking about it.